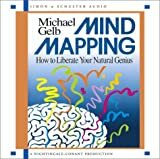 Those who have not yet heard of Mind Mapping will find in Michael Gelb's succinct CD, an introduction to graphic methods to "wake up your brain" as he says, and may very well find techniques for improving intelligence itself. But the CD is not the best place to learn how to do Mind Mapping, because the tools and methods have to be seen. Mind Mapping, according to this CD, was invented by a British colleague of Gelb's, Tony Busan. It's clear that this tool was evolved first as a new way to take lecture notes effectively and concisely and without the bother of scribbling down every word. But Michael Gelb goes to some lengths to convince us that Mind Mapping is much, much more than pictures as note-taking. Mind Mapping is a natural reflection of how our minds work, he says, and therefore, a brilliant new way to think, set goals, get results in just about any area of activity. Much of subject of this CD is Gelb's argument for why Mind Mapping is more than making notes, why it should be seen as a breakthrough set of methods and why these can effect real changes in our performance. So, I think it's fair to say this program is motivational in design and scope. And that's not a bad thing. This reviewer had not previously seen Mind Maps. Had I merely found them on my own through a Google search, I feel sure I would not have taken more than a passing interest in what looks at first like a colorful way to take notes based on key words, use of capital letters, and lots of picture drawing. Gelb's CD gets credit for telling us in specific detail just what Mind Mapping can do for our note-taking, how it follows the brain's natural ways of making associations and retaining information, and how Mind Mapping can become a powerful tool for learning and mastering every sort of challenge people face. If there is a down side to Gelb's approach it is that a CD is not visual--you cannot see what a Mind Map looks like. Instead, you can Google "Mind Mapping" to see that and to learn how to mind map in a step-by-step fashion. But Gelb's CD will get you started using Mind Maps in ways that are fresh and even a bit startling if you have, like me, been outlining materials with complete sentences for a long time. Mind Mapping replaces outlining; that's for certain. And it can enhance how we create and think. Good Mind Maps can be three-dimensional and always involve pictures. In fact, you start any Mind Map by drawing a picture of the main subject you are interested in. So, for example, if you flew to Paris, France with your spouse and wanted to figure out how best to use your few precious days in the city, you would draw, say, the Eiffel Tower at the center of a piece of blank paper. That's another way to say "Paris." Your Map would start with radiating lines to each of the areas of interest and you'd follow the basic rules of Mind Mapping: summarize information, simplify, use capital letters on lines, etc. Soon you'd have something that shows the shape and scope of what you can do in Paris; you'd have time lines and a completely memorable way to block out your visit effectively. It would be creative, it would outline and solve problems, help your recall because it's associative not linear like notes. And it's all on one page. Now, is this, as Gelb asserts, more than fast, efficient notes? Is it a way to unlock that latent genius we all hope to find in ourselves? Obviously, that cannot be confirmed without giving Gelb's methods and instructions a test drive. His CD provides several such exercises (you know, stop the CD now and do the following exercise...), including one in which you get to make twenty-five Mind Maps. Anyone looking for ways to be more effective should get this CD and learn these tools thoroughly. This reviewer started out skeptical and has rapidly transformed his attitude toward active participation. There is just too much data, too many demands made on us all not to make use of a graphical tool set that simplifies and improves our chances of remembering all the things we're trying to accomplish.